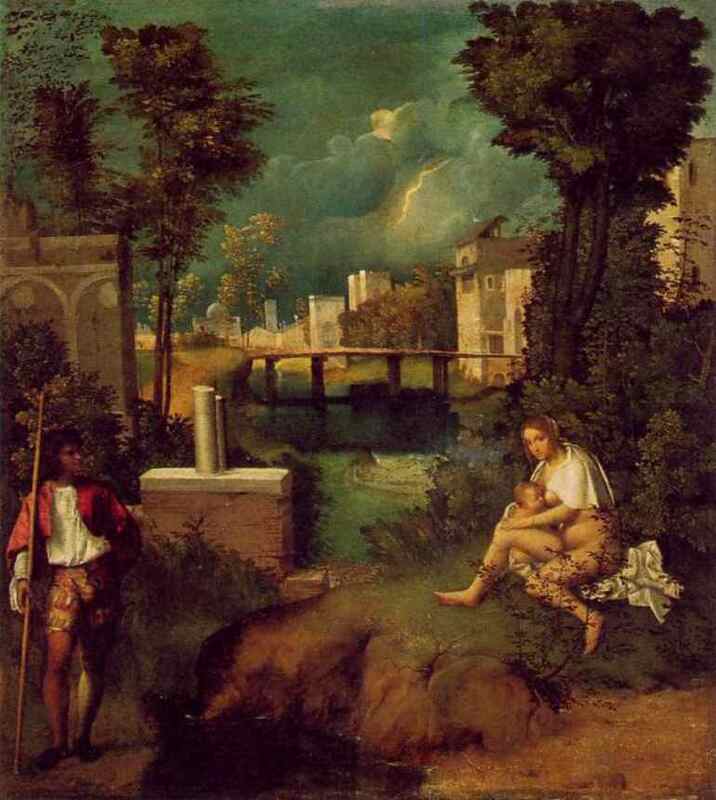 In my last post I revisited my interpretation of a painting by Giorgione that has been lost but that still exists in seventeenth century copies. It is usually called the Discovery of Paris but I have argued that it is a depiction of the legendary encounter of the Holy Family with robbers on the flight into Egypt. I also believe that it is one of the two "notte"that Isabella D' Este sought to purchase in 1510. Below I reproduce my discusses of the two paintings with an addendum about Vittore Beccaro, the owner of the one that Isabella's agent called "finer in design and better finished". 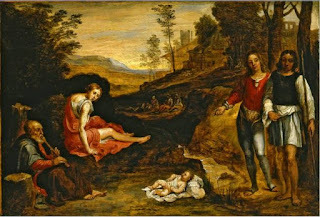 Since that time scholars have not been able to agree on the identity of the two paintings mentioned in Albano’s letter. Neither have they been able to agree on what Isabella or Albano meant by “notte” since the word hardly appears elsewhere in descriptions of paintings. However, from the correspondence we can say that both paintings were commissioned: “the owners have had them painted for their own pleasure.” The one that was not as “perfect” as Isabella would have desired was done for Venetian patrician, Taddeo Contarini. The other “notte”, the one “finer in design and better finished,” was done for Vittore Beccaro, of whom nothing else is known. Not only was Beccaro out of town at the time of Isabella’s inquiry, but he seems to have completely disappeared from history. Pozzolo noted that a discovery of Paris coupled with an Aeneas and Anchises would mark the beginning and the end of the whole Trojan saga. 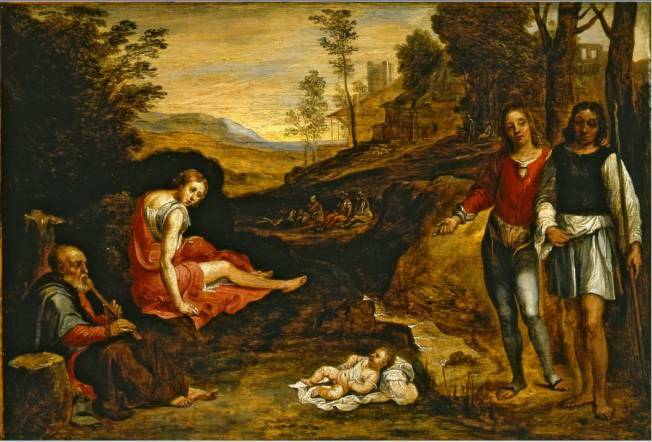 However, this hypothesis is based on a misinterpretation of the “Discovery of Paris.” I have argued elsewhere that this lost Giorgione is a depiction of an episode on the flight of the Holy Family into Egypt. It is clear that in this early work Giorgione relied on a text from the apocryphal Arabic gospel of the Infancy. Even from the copy of the “Discovery of Paris” done by David Teniers in 1655, we can see that it is not one of Giorgione’s most perfect works. This early effort seems crude in comparison with his later work. 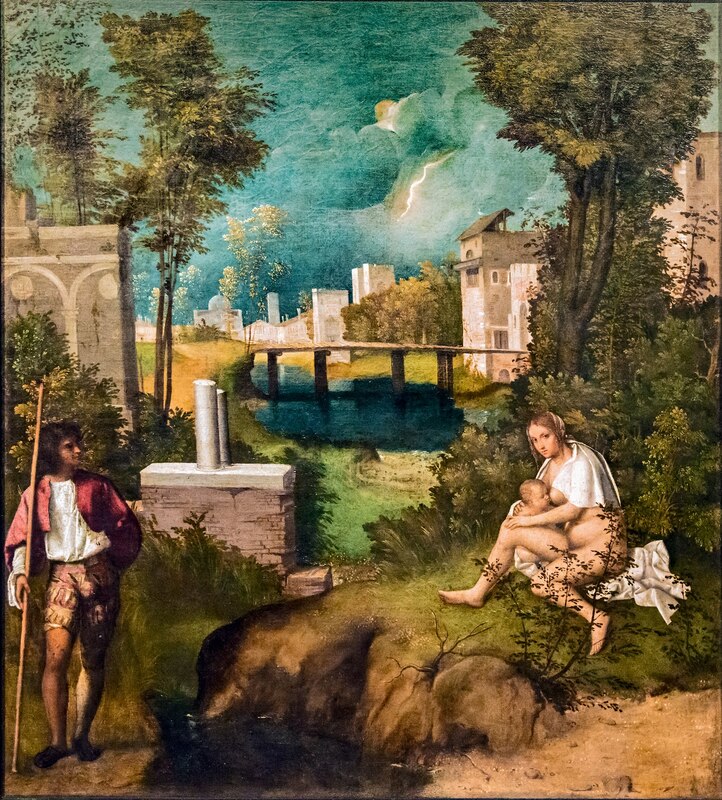 Since I have argued that Giorgione’s most perfect painting, La Tempesta, is also a depiction of the Rest on the Flight into Egypt, I believe it is safe to say that it was also the “notte”, “very beautiful and original,” that Isabella unsuccessfully sought to acquire right after Giorgione’s death in 1510. Finally, I would like to speculate on the identity of Vittore Beccaro. 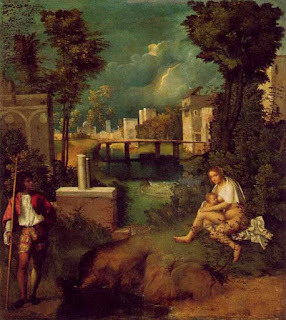 Enrico dal Pozzolo suggested that the name implies that he might have been a butcher but it is hard to imagine, given Giorgione’s patrician patrons, that the Tempest was commissioned by an ordinary tradesman. It is true that Taddeo Albano claimed that Vittore Beccaro was the owner of the beautiful “notte”. But Albano got his information second or third hand from acquaintances. It is clear that he did not know the owner or even see the painting. At my age, it is easy to imagine that Albano could have rendered the name somewhat incorrectly. Instead I would like to advise students to look in the direction of Bologna whose leading citizens included the Zambeccaro family. I also believe that some members of the family fled Bologna for Venice after Pope Julius II drove out the ruling Bentivoglio family in 1506. At least one of the Zambeccaro was an art collector. In his biography of Franceso Francia, Giorgione Vasari said that Francia was a close friend of Polo Zambeccaro. The status of Polo Zambeccaro enabled him to commission a painting from a renowned painter like Francia. Moreover, he asked for a sacred subject, a Nativity, for his own private devotion. Polo Zambeccaro would have been the type of person who could have asked Giorgione, the up and coming favorite of the Venetian aristocracy, for "a picture of a Notte, very beautiful and original," a painting that would later be called the Tempest. It is still not for sale at any price. *Isabella’s correspondence with Taddeo Albano can be found in Julia Cartwright, Isabella d’Este, Marchioness of Mantua, 1474-1539. London, 1932. For the Italian text see Jaynie Anderson, Giorgione, The Painter of Poetic Brevity, p. 362. **Enrico dal Pozzolo: Giorgione, 1999, pp. 33-35. ***Vasari, Giorgio: Lives of the Painters, Sculptors and Architects, translated by Gaston Du C. De Vere, with an introduction and notes by David Ekserdjian. 2V, Everyman’s Library, 1996. Vol. 1, 581. *** The above is part of a post that was one of the first to appear at Giorgione et al... back in 2010. I reproduce it here for new readers. It can also be found at MyGiorgione with my other major papers on Giorgione, Titian and the Venetian Renaissance. In the past seven years I have seen or read nothing that would make me want to change my interpretation of this lost Giorgione.